"A Letter of Mr. Isaac Newton, Professor of the Mathematicks in the University of Cambridge; Containing His New Theory about Light and Colors: Sent by the Author to the Publisher from Cambridge, Febr. 6. 1671/72; In Order to be Communicated to the R. Society." Philosophical Transactions of the Royal Society of London. 1671. 6: 3075–3087. 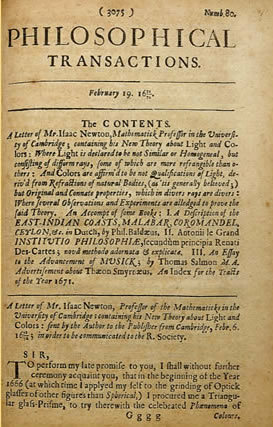 Isaac Newton published his groundbreaking opus on light and optics, Opticks, in 1704. However it was in the present work which appeared in Philosophical Transactions, that his theories first came to light. Newton showcased his observations on light using prisms, where he shows that white light is composed of rays of different colors, which can be separated with a prism. The paper, in which Newton details his experiments and findings, is the foundation for most of the subsequent work in optics.